This timely look at a neglected corner of Japanese historiography spotlights the decade following the end of World War II, a time in which Japanese society was undergoing the transformation from imperial state to democratic nation. For certain working and middle-class women involved in education and labor activism, history-writing became a means to greater voice within the turbulent transition. 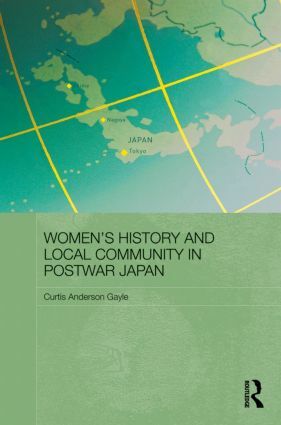 Women's History and Local Community in Postwar Japan examines the emergence of women’s history-writing groups in Tokyo, Nagoya and Ehime, using interviews conducted with founding members and analysis of primary documents and publications by each group. It demonstrates how women appropriated history-writing as a radical praxis geared less toward revolution and more toward the articulation of local imaginations, spaces and memories after World War II. By appropriating history as a praxis that did not need revolution for its success, these women used connections established by Marxist historians between history-writing and subjectivity, but did so in ways that broke rank from nationally-referenced renditions of history and memory. Under conditions in which some women saw history as a field of articulation that remained dominated by men, they put into practice their own de-centered versions of history-writing that continue to influence the historical landscape in contemporary Japan.